Will Hutchins on Buster Keaton. Howdy! Let us hearken back to those halcyon days of crystal sets, victrolas and ten cent comic books—the time of the Great Depression—(What was so great?) The skies were grim and gray, but our hearts were young and green. These were our salad days, and we kids of Atwater knew everybody from the L.A. river to the Glendale RR tracks. Marvin Mitchelson joined us at night on the street for wild games of kick-the-can—He grew up to become the palimony lawyer from Hell. Guy Usher of Monogram flicks fame lived jes’ down the road apiece in a properly spooky Tudor house. One street over lived a feller name of O’Leary. He’s in the Guiness Book of Records—He hiccupped non-stop for years. A living skeleton—the Pope prayed for him. Former Miss America Rosemary LaPlanche and former Keystone Kop Hank Mann were Atwater Village people. We kids lived for summer vacation and Saturday matinees at the Atwater Theatre—(Grown-ups keep out!) From Sunday to Friday parents, preachers and teachers ruled. Saturday afternoons were ours! The lights lowered—Instant bedlam. We couldn’t hear the dialogue—we demanded Action Aplenty! Our heroes were Hoppy, Gene, Roy, Larry, Curly, Moe. We spent as much time on our feet as on our seat, just as the crowd roars and rises when a halfback makes a 60 yard TD run. Kinetic empathy-noise and energy to rival a rock’n roll marathon. My soul still sings, my ears still ring. Bob Arbogast is the funniest fellow in my lifetime. Arbo talked back at the screen. During a romantic lull he’d shout, “He’s going to kiss her!” He’d pull a rubber spider up the aisle with a string, and all the girls would shriek. Just before the curtains parted for a showing of “Frankenstein,” Arbo yelled, “Here comes the monster!” and he lurched across the stage. He was barred, of course. We’d sneak him in through the back exit door. Going to the flicks was a whole lot more fun with Arbo in the audience. After the show we’d ride our bikes to Griffith Park to re-enact highlights from that afternoon’s movie menu. Or we’d play a game of Arbo’s invention, ‘Machine Gunner’. We’d charge at him down a grassy hill. He’d be waiting with his Tommy gun, a tree branch. He was Paul ‘Scarface’ Muni spitting at us—Rat- tat-tat-tat! And we all fell down and rolled to the bottom. Arbo would pick the guy he thought performed the most spectacular ker-plop, and that guy was then ‘Machine Gunner’ for the next tumble-down, free to choose his own weapon: hand grenade, throwing-knife, poison gas, sling shot, whatever. We all had a wide repertoire of tucks and rolls, suitable for all systems of our mass destruction. Folks ask me if I miss L.A., and I tell ‘em, “Yup, I miss the L.A. that used to be.” Smog-free, freeway-free, carefree—Why the air was so clean and clear you swore you could just reach out and touch the mountains. Nowadaze, you can’t even see them! 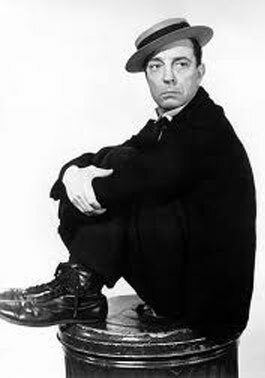 Buster Keaton perfectly captured on film early 20th Century L.A. Stately craftsman houses on wide avenues, non-littered vacant lots, street cars, swanky guys and glittering gals on the town. Keaton’s depiction of the idyllic beauty of 19th Century rural America in such classics as “The General” and “Steamboat Bill Jr.” compares favorably with Matthew Brady’s daguerreotypes of the Civil War. Buster joined the Industrial Revolution and mastered his favorite machine, the movie camera. In “Sherlock Junior” he plays a motion picture projectionist who jumps into the screen and becomes part of the movie. That was Buster. He became one with film—never before nor since has there been a greater movie star-clown-director-athlete-creator in the world of flickdom. He was responsible for whatever you see on the screen while watching his masterpieces. Ah! The Great Stone Face. Louise Brooks, the fatalist of all femmes, said, “Since childhood I have thought Buster Keaton’s the most beautiful face of any man I ever saw.” Buster made no conscious effort not to smile. He was so profoundly into all the mechanics of putting the best possible product into the market place that he had no time for monkey faces. He was completely absorbed, focused, concentrated, aware. He was a perfectionist. He learned this from his mom and dad while touring the country in their knockabout vaudeville act, The Three Keatons. Practice! Practice! Practice! He plays a cave man in “The Three Ages”, hotly pursued over pre-historic boulders by a rival tribe. They want to kill him. (Buster showed us how funny life is. Also how dangerous.) His only weapon is a club. He encounters a foe who throws a rock at him. Buster slams it on the fly like a baseball right back at his foe who falls like a shot. Five seconds of screen time—took all day to get it right. Buster wanted to show the gag in one long shot. No cuts. No tricks. No cheats. It really happened before the audience’s very eyes. The audience knows. One day Buster visited the set of an Abbott and Costello comedy. The crew was setting-up for the next shot. Bud and Lou were at a table with cronies playing poker. This was sacrilege to Buster. He quickly vanished. In New York City, at Lincoln Center there was a ballet based on one of Buster’s classics, “Seven Chances”. At the climax, Buster is chased down a steep hill by huge rocks. His tremendous acrobatic skill (which he always displays with grace and simplicity) allows him to dodge the killer rocks only to be chased some more by an even greater danger: a horde of would-be brides, each wanting to marry him. Buster’s feature films are primarily heavy melodramas inlaid with breath-taking physical comedy, his recipe for creating works of genius. Danger, Buster Keaton! He had many close calls in real life as well as in reel life. He almost drowned while filming the river rapids sequence in “Our Hospitality.” He broke his neck during a high action scene in another epic. Months later a doctor discovered the break while examining Buster’s x-ray. 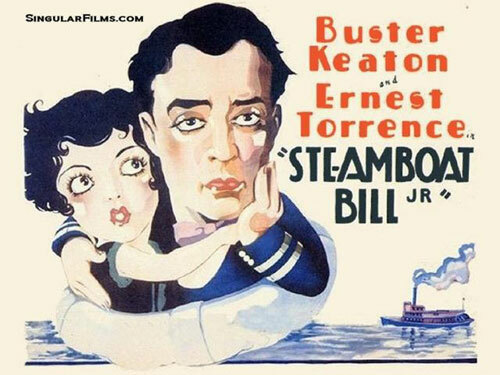 In “Steamboat Bill Jr.” Keaton allowed a two-ton house front to collapse over him like a giant fly swatter with only a three inch clearance of an open window to prevent his being crushed to a pulp. In “The General” he demonstrated derring-do to the Nth degree, running and cavorting atop a rapidly moving train. Absolutely no film-flammery involved. Whatta guy! He was the most silent as well as the most cinematic of silent screen comedians. Talkies dealt him a devastating blow. Even so, Buster Keaton’s silent comedies will be shown to loving throngs from here to eternity. I’d recently bought. She repaired to her bedroom, and within half-an-hour she fashioned me a pork pie hat, just like the ones she made for Buster (right). (He wore out twelve a year.) It now hangs on the wall facing my desk. I’ll treasure my Buster hat forever, or until I pass on thru, whichever comes first.